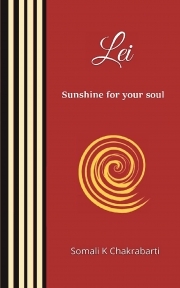 ‘Lei: Sunshine for your soul’ is a series of short/micro poems that are inspired by nature and reflect on different hues of life. The word ‘lei’ refers to a garland or a wreath in Hawaiian language. In Hawaii, visitors, on arrival, are greeted with a warm ‘aloha’ and adorned with beautiful, fresh ‘lei’ as a symbol of affection. Each poem, in the book is like a fragrant flower, meant to celebrate life, generate positivism, soothe, inspire, nourish and rejuvenate the Soul. Emotional and enlightening for any age, the book is composed of four sections: Nature, Life, Inspiration and Illusion. Most of the short poems are written following the Japanese style of micro-poetry (a Haiku or a Tanka). The poems illustrated with imagery, are layered and imaginative, very short and simple to read, and convey a deeper meaning or bring out a new tinge of emotion every time you read them. Somali K Chakrabarti is a Process Innovator, Management consultant, Leadership Coach and Creative Blogger. Drawing inspiration from nature, art, philosophy, history, management and science, she connects the dots, writes to stimulate imagination and provoke thought.